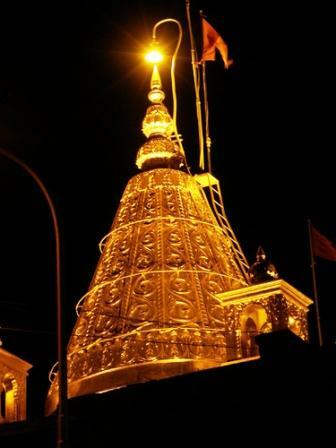 The last time I took on to words to share my blissful experience of visiting Sai Dhaam Shirdi was almost a year back. Baba’s grace has been showering upon allowing me to visit and have his darshan every month…His grace, in that sense, is truly boundless. Consequently, every month on the third Friday (almost), the tiresome week signs off bidding good bye to the hard toiled days & opening its arms to welcome and embrace the weekend with a silent wish and hope that Baba’s divine vision continue to grace my trip with eternal bliss and contentment. As an afterthought, as I am reliving those moments of the month writing them down, I just remembered that I had reserved the full description of Sai Dhaam Shirdi to some other occasion and (strangely enough) that occasion is still waiting to see the dawn of the day (guess it’s high time to get rid of this procrastination stuff!!). The trip to Sai Dhaam Shirdi is always mesmerizing and now it has become so much a part of life that no sooner does one of the trips completes, the anticipation of the forthcoming starts to hover. So on the designated day, I started from my office in the evening and accompanied one of my friends till metro station with a plan to catch Airport Express Metro therefrom. The day was tiring and fatigued (as all Fridays and Mondays surprisingly are). To avoid last minute rush, we started from the office well in time, however, as luck would have it, the moment we hit the national highway, a massive traffic jam awaited our arrival. Even after spending almost half an hour, the car just managed to cover a very small distance. As the clock was ticking, there were a flurry of thoughts rambling in my mind and soul moving me at the edge of my seat. I couldn’t help myself thinking and wondering about the outcome of this race against the time. Somewhere at the back of the mind the “What If” scenarios were also being worked out along-with a silent prayer to Baba to let me reach on time and not to miss the train, which at that moment appeared quite probable. But, fortunately, our crawling managed to take us past the jam and with exactly fifty minutes left for the train departure, I was dropped at the metro station. Without wasting much time, I took the ticket and harped on the first available metro to avoid further loss of time. By a fluke, I made to the station just in time as the clock still displayed ten minutes for the train to start. That indeed appeared a positive start - a good omen, as Paulo Coelho puts in The Alchemist. The irony of being a lone traveller accompanied me this time too and no sooner did I sank to my seat (which was lower berth), pairs of prying eyes of the fellow passengers scanned me from top to bottom. The look on their faces and the glance they shared amongst themselves made me mindful of the probable proposal which would be hurled to me at any time. And the next few minutes proved me right when one of those pairs of eyes widened up into a smiling face and supplicating tone, “Are you travelling alone?” That familiar question took me to the flashback of many requests of a similar kind to which I succumbed despite my innate desire to refuse. That’s commonly when the request is to exchange the lower berth with some other seat and whenever such proposal is made, I realize that the child in me wakes up incredulously. Anyways, quite reluctantly, I consented for the seat swap with a consolation that the exchanged seat was also a lower berth albeit side lower. Life is a strange mix of events and sometimes tends to surprise us with its déjà vu element. My arrival to the new seat was again welcomed by another pair of meddling eyes but this time the glance was soothing rather than disturbing and the smile that accompanied was warming rather than conspiring. There was an old lady who was already sitting on that berth and there was some instant association with her that kicked within me. The sight of her instantly reminded me of my grandmother whom I miss badly even now. Thus, when she asked for another seat swap, I couldn’t refuse and instantly moved to her seat, even though that was an upper berth. And before moving, I don’t know why, the innermost part of my heart nudged me hard to touch her feet and needless to say I did and got her blessings in return. There are no reasons for some of your acts in life and the joy that these deliver eventually absolve you from searching them anyway. These rounds of seat swapping landed me to the seat near the exit door as against my original berth which was in the middle of the coach. As it was already late night, I retired to sleep in my couch with some long forgotten visions of my good old days with grandmother that lay afresh and anew cloaked under the layers of time and tide. I don’t remember when while dabbling with those bouts of anamnesis did the sleep queen actually overtook me in her stride. Strangely enough I discovered that rest of my mates in the coupe were a part of the same (big) group who were coming from Kaashi Vishwanaath, going back to their home in the south. And unfortunately, most of them were ladies constantly chatting in their regional tongue (perhaps Tamil or Telugu in either case, alien to me) and giggling throughout. Poor fellow, me, could only manage to pop up my head occasionally from the book I was reading and smile meekly still trying to figure in my mind as to who was their subject of constant laughing!!! “Amma you seem to be lost a bit. Hope all’s well?” I asked. She smiled, “Yes son, it was just that I wanted to make an offering to Baba before culminating the trip. I am a devotee of Sai Baba and when we started for the trip, I requested Him to give me a chance to make an offering to Him during the trip as a token of His blessings. He has been guiding me through-out but my ill luck, I didn’t get any chance of making the offering to Him, which is making me restless a bit.” She showed me some currency notes and a coin tied in a rubber band which she had kept aside to be offered to Baba when she had started for the trip. “Amma, I am going to Shirdi. If you wish, I can offer these to Baba’s holy feet on your behalf” I said. Baba always assures HIS children, "If one devotes their entire time to me and rests in me, need fear nothing for body and soul”. And as the next set of events unfolded, I became all the more affirmed as to how true HIS assurances and words always are. No sooner did Amma complete her prayer, one of her group member held her from behind smiling and asking, “Where have you gone, we were all looking for you since long”. I was speechless. I took the money from her assuring that I will place them at Baba’s lotus feet and bid her good bye.